Pug Pocket Mirror-The Best Gift! 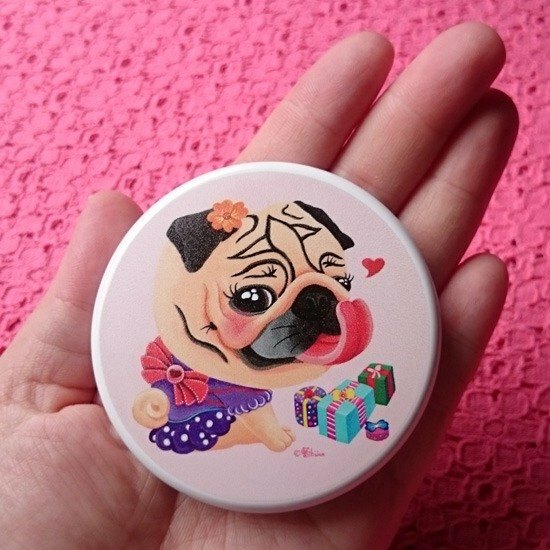 **Pug Pocket Mirror ♥ The Best Gift! ** **<Why You Might Like This>** ♥ Cute Pug Design. ♥ Pug Lover Gift. ♥ Share The Pug Love. **<Materials & Specifications>** ♥ Material: plastic ABS, 2 glass mirrors. ♥ Specification: about 68mm in diameter (Image: about 64mm in diameter) ♥ Weight: about 100g ♥ Package: kraft paper box. ♥ Origin: Designed/ Made in Taiwan. **<Shipping Information>** ♥ This product will be shipped by regular air parcel. ♥ The shipping time depends on the logistics companies. Therefore, an exact date cannot be given. **<Returns Policy>** ♥ Buyers may return an order and request for a refund within 7 days counting from the day after the order arrives at the recipient’s address. ♥ Buyers are responsible for all shipping fees including the shipping fees of returns. ♥ For returns/exchanges, please ensure that the product and packaging are returned in the same condition as you received them (including the product, packaging, accessories, free gifts, etc.). If any item is missing or the packaging is not in the same condition, returns or exchanges may be denied. **<About Me>** Welcome to ♥ **SihWun's Pug World** ♥ Hello, my dear friends, my name is SihWun, a girl who is falling in love with pugs. Welcome to my cute pug world! I love pugs so I draw pugs, and I wish I can share the "pug love" to you.